6’6 is tall and he’s a tall dude. I’m sorry. That should read: Your Excellency is of tall stature. I’m talking about the Governor of Massachusetts. But I’ll get to that in a second. Swampscott (pronounced: “swom skit”), Massachusetts. Aside from being two words that are hard to spell, it’s the name of a very old American city steeped in tradition and history. 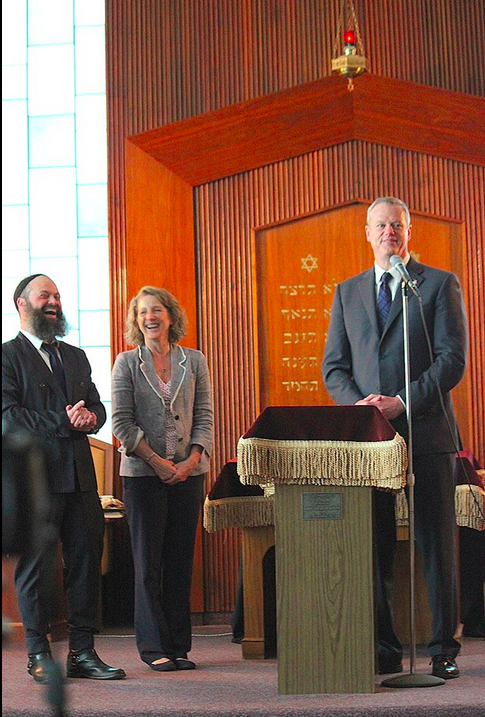 I was there on Sunday to honor Rabbi Yossi and Layah Lipsker, at a dinner celebrating their 23rd anniversary on New England’s North Shore (pronounced: “nawth shaw”), and the beautiful community they have created. You can buy a house, but a home needs to be grown and nourished. The same applies to a community. 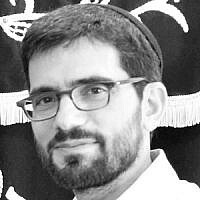 The Lipskers just happen to be experts at this, and along with Rabbi Shmaya and Aliza Friedman, what they’ve built is inspiring. At the dinner, I had the distinct pleasure of meeting Governor Charlie Baker and his wife Lauren. If you aren’t from Massachusetts, he’s the new guy, a moderate Republican, in a very blue state. During the picturesque Amtrak ride from NYC to Boston, I read about his pleasantly surprising 70% approval rating. By the time the event was over, there was nothing surprising about it at all. I’ve met a fair share of politicians. I was at the presidential debate in Richmond, Virginia, when presidential hopeful Clinton debated Bush ’41. President Clinton is one of the most charming, charismatic people on this planet. When it comes to cool, no President has been or probably will be, cooler than President Obama. Governor Baker is not charming or cool. Well, you might find him to be, but he certainly isn’t trying to be. And charming and cool aren’t adjectives that you first think of when describing him. Real. Focused. Big-hearted. Determined. Good husband. Mentch. I know. I know. Here comes the cynicism. On the food chain of occupations, most people consider them one level beneath car salesman. They promise and promise and hardly ever deliver. I‘m well aware. The Governor and his wife Lauren are real people. Not fancy. Down to earth. Of the people. As we stood there and people came over to shake their hands, take a picture and say “I voted for you!”, you got a sense of something very special about them. But please consider putting the cynicism on hold for another 350 words. 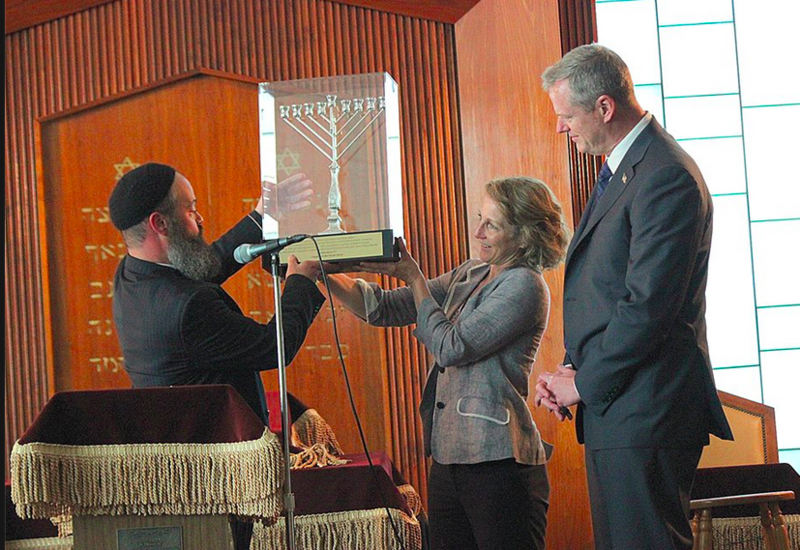 At one point in the program Rabbi Lipsker called the Governor and first lady up to receive an award. She spoke about how wonderful it was to be at an event where you felt the warm embrace of a community. The governor began his remarks by saying, “If I’d known what you were serving tonight, I wouldn’t have eaten today,” which was met by laughter, and then more laughter, as the microphone had to be extended to its full height. He went on to echo his wife’s sentiments and to share two ideas. He stood there on stage, casually, not in a hurry, without platitudes or the mannerisms of a politician. The first point he made was about a Bat Mitzvah they had attended a few years back and how the mother of the Bat Mitzvah girl spoke so movingly to her daughter, to the point that “Lauren and I were bawling our eyes out.” After that Bat Mitzvah they decided that they were going to have similar talks with their three children when they turned 13 in order to communicate their hopes, dreams and aspirations for them. His second point came straight from his heart and was unscripted. 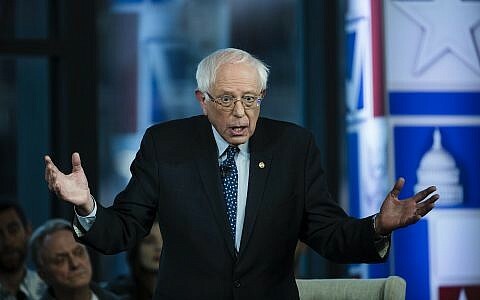 He said, “I know how hard it can be sometimes to be Jewish.” He was I think, referring to a recent despicable anti-Semitic act in Lynn, the town next to Swampscott, as well as the recent disturbing uptick in anti-Semitism in Europe, including the Paris supermarket murders. With tears in his eyes he said, “This just isn’t right and it’s unacceptable”. He went on to talk about what Judaism has given to the world and the proud heritage of the Jewish people. I know that reading these words on paper isn’t doing them justice. It wasn’t just the words. It was the sincerity. It was words coming from the heart. And words that come from the heart enter the heart. How many people go into politics for the right reasons? I don’t know. How many actually have the ability to lead? To be visionaries? What I was trying to say with that hug was, you’re a breath of fresh air, the kind of leader our country needs. I know you aren’t thinking about this, and you shouldn’t be. There’s work to be done in your state. But I would be remiss if I didn’t say that Abe Lincoln was our tallest President at 6’3. A President who is 6’6 sounds about the perfect height to me.